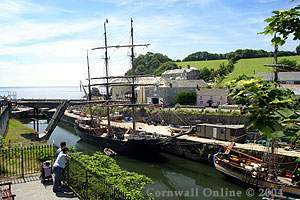 Charlestown Shipwreck & Heritage Centre is a fabulous museum exhibiting the largest private collection of shipwreck artefacts and memorabilia in Europe. This fascinating collection has been put together over the past 50 years and includes items recovered from over 150 stricken vessels. Displays at the centre include artefacts recovered from famous shipwrecks such as Titanic and the other stricken White Star Liners. There is also a fabulous collection of artefacts recovered from various World War vessels such as the HMS Edinburgh, which was known as 'Edinburgh Gold' due to her large cargo of gold bullion! There is also a superb collection of memorabilia relating to Admiral Nelson, which gives a fascinating insight into the life and career of our country's greatest Naval hero. The centre offers both indoor and outdoor exhibits, a wonderful restaurant with splendid views of the harbour and a fully stocked gift shop. With so many fascinating exhibits the centre certainly has something of interest for everyone and is definitely worthy of a visit.